We check over 450 stores daily and we last saw this product for $574 at Barneys New York. 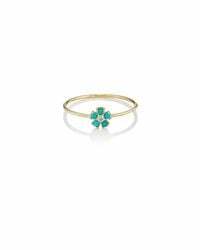 Showcasing a gemstone-embellished flower atop a fine wire band, Jennifer Meyer's Mini Flower ring is handcrafted in Los Angeles of polished 18k yellow gold. The petite flower is composed of round turquoise cabochon "petals" and a sparkling white diamond center. Handmade. Cabochons rest in prong settings. Gypsy-set round white diamond. Round turquoise cabochons. Polished 18k yellow gold. 1mm band width, 5mm face diameter (approximately). Size 6.5.